Deepika Padukone is currently recuperating from her back pain while her beau is grappling through a shoulder injury. Co-incidence, much? Sadly, yes. But busybee Deepika has her hands full despite not busy on the film sets. 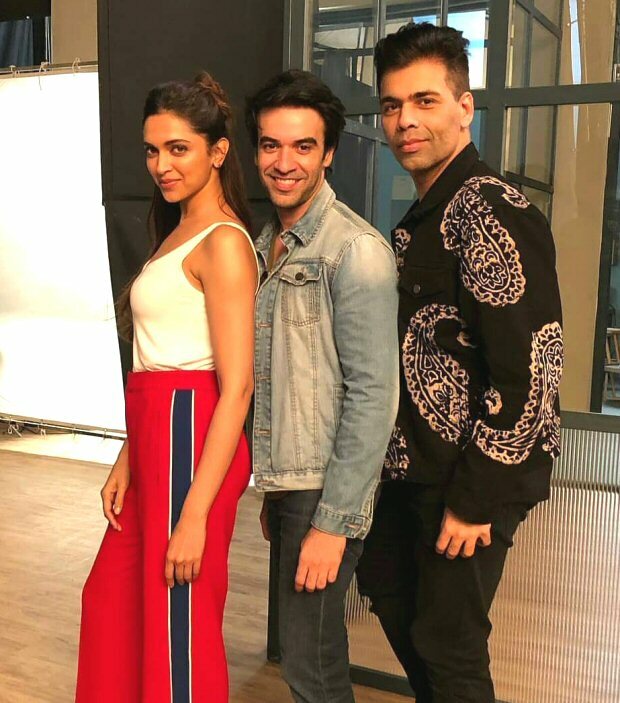 Karan Johar just shared a picture of them on Instagram titling, ‘Left profilers’. Yes, that’s right this was clicked on sets where Karan was directing Deepika along with his Student Of The Year 2 director Puneet Malhotra. The terrific trio was shooting for an ad. Aren’t you excited to watch it soon? Over the weekend, Kareena Kapoor Khan’s video from an ad shoot went viral and guess who was directing it? Puneet. We can’t wrap our heads around this connection and looks like both Bebo and DP share a common connection here and might be a part of same project. Only time will tell us if this is true. Deepika, we hear, is utilising this unexpected break by getting her wedding trousseau ready. Sources close to the actor have informed that she is planning to tie the knot with Ranveer Singh by the end of this year and it seems that she is shopping for her jewellery with her mom and sister in Bangalore. We hear that parents of both Ranveer and Deepika met up and discussed on auspicious dates for the pre wedding ceremonies. They were given muhurats from September to December. Wedding prep therefore was kick-started post this. Deepika will be seen next in Vishal Bhardwaj’s next film based on Mumbai mafia queen Sapna Didi. Bhardwaj has put the film on hold as DP is recuperating from back pain and her co-star Irrfan Khan is abroad, getting treated for neuroendocrine tumour. We hope Irrfan gets well soon and DP too is up and about in no time. Also Read: Weekly Airport Style: Deepika Padukone, Karan Johar, Sidharth Malhotra, Sunny Leone and Aditi Rao Hydari slay in classics with a twist!